Huma Jafry-Lalani is pursuing a Ph.D. in nanotechnology – one of the newest fields of scientific research. It has a wide range of applications, and offers the possibility of addressing some of the world's most pressing issues. Imagine gold that can cure cancer, a television screen that rolls up like a tube of paper, or material that is ten times stronger and lighter than steel. This is no reverie of alchemy; rather, it is a sample of what nanotechnology – one of the newest areas of scientific research – is striving to offer. Simply put, nanotechnology is a science that aims to manipulate particles of matter that are nearly 70 000 times smaller than a strand of hair, and promises a world of tantalising possibilities. The National Nanotechnology Initiative, a federal research and development programme in the United States, explains that, “at the nanoscale, the physical, chemical, and biological properties of materials differ in fundamental and valuable ways from the properties of individual atoms and molecules or bulk matter.” In other words, nanotechnology operates on a scale so small that the usual constraints that scientists face when manipulating particles at either the atomic or conventional levels cease to be an impediment. Nanotechnology can be applied to countless fields, ranging from medicine and cosmetics, to law enforcement and international development. Huma Jafry-Lalani, a nanotechnology specialist residing in Texas, was attracted to the field while pursuing a double degree in Computer Science and Economics. During her final semester at Mount Holyoke College in Massachusetts, she attended the Rice Alliance Nanotechnology Venture Forum in Houston. It was here that she met her future mentors, Rice University professors, Dr. Robert Curl and the late Dr. Richard Smalley, both Nobel Laureates. “It was thrilling to understand how professors at Rice were tailoring solutions using this very unique nanoscale science, and the opportunities that lay ahead for people in both the scientific and commercial arenas,” Jafry-Lalani reminisced. On the brink of joining the investment banking profession, she switched gears, and decided to pursue a Ph.D. in nanotechnology at Rice. Perhaps one of the most enticing possibilities of nanotechnology is its capacity to address one of the world's most pressing issues: the availability of clean, potable water. A paper commissioned by the Meridian Institute's Global Dialogue on Nanotechnology, titled Nanotechnology, Water, and Development, states that a shortage of drinking water and sanitation kills 4 500 children a day, largely due to waterborne diseases caused by E. coli, salmonella and choleric bacterial infections, as well as parasites and viral pathogens. All five vials contain liquid made from the same material but with differing particle diameters. 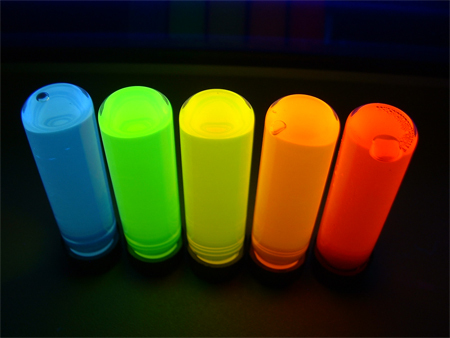 Variations of only fractions of a nanometre can alter the colour of the solution: blue (2.0 nm), green (2.5 nm), yellow (3.0 nm), orange (3.9 nm), and red (4.2 nm). Research is being conducted into how colour-tuning based on particle size could be applied to health care diagnostic imaging, optics, optoelectronics, and other fields. The use of nanotechnologies in four key water industry segments – monitoring, desalination, purification, and wastewater treatment – is making a profound difference in the quality of life in developing countries. A range of water-treatment devices that incorporate nanotechnology are already available while many others are in varying stages of development. For example, iron-oxide, commonly known as rust, is just one of many agents currently being researched. When broken down at the nanolevel, iron-oxide has the unique ability to absorb poisonous arsenic from contaminated water. Jafry-Lalani is excited less by the theory and more by the practical application of nanotechnology. She is hopeful about the possibilities that the technology offers in improving quality of life among disenfranchised populations, and seeks to make a contribution through her research. It will take time for nanotechnology to develop; however, in 10 or 20 years time we may have good reason to thank pioneers such as Jafry-Lalani. They will have become the architects behind the “nanosolutions” to some of the world's most pressing problems.